Endowments An Important Preparation For The Future . from one generation to another." help insure the continuity of vital Federation services. ner, the late Irving Blum. In The Foundation Board Spotlight.. .
Ethel Waldman and Gerald William. Brian J.
Janice Salit is director of Foundation. munity in which he lives. my first wife passed away." who will come after me." tion will have a source of emergency funds. Charitable Remainder Trusts, Charitable Lead Trust among others. and suggestions for future programs. Fort Lauderdale is Deborah F.
"We are not finished yet,"
directors took place Wednesday, April 2, at Pier 66 Hotel. Plantation: Susan Canarick, Sheila Grenitz. The source of all our strength. It gives our lives more length. A Lighthouse in the dark. That makes us toe the mark. (More potent with the years). To take each word to heart. Director of the Central Agency for Jewish Education. leading into a lively discussion of today's America.' Jewish family. many left behind when they moved to South Florida. Federation, on Friday April 18. Kent at the Federation, 748-8400. 2 seders with Cantonal service. imately 15-20 percent are 65 years old or older. fear, loneliness and physical disability. parents and grandparents. Their memories are our heritage. Their hardships are a reproach to our affluence. Transportation to doctors, JCCs, etc. life through integration with the surrounding people. seeing the Jews as one collective with its own special problems. Thus was the separate Jewish national movement born. sometimes act as a catalyst for Jews to reconsider their situation. But this is just one element in a broader process. there is no sharp split between the two, according to Dr. Graetz. tionalism was a kind of instinctive act of ethnic self-preservations. a desire to see it continue and not disappear. historical questions in the context of their own time and place. set and into a separatist one. "4. Take out the garbage. "5. Stack dishes in dishwasher. one out secure the house. tion and a change of pace. gnaw at those far from home. U.S. lines in U.S. uniforms. U.S.
shot" by U.S. security patrols. Day and when they have babies." reflects a solid religious training. Marine Corps officer," he said. challenges in serving our country. I love the sea and ships." helps supervise the honor system. to them the day they arrive." Army, 60; Air Force, 40.
during their training and service. discussion on "Ethical Wills: Love Letters from the Beyond,"
Rabbi Kurt Stone, spiritual leader of the Temple. experience is being planned. Dr.
their invitation prior to April 1.
held on May 8 from 10 a.m.-2 p.m.
to Refusenik Lev Gandin recently. I have adopted the cause of Mr.
a 10-year report on Florida's sprawling social services agency. the April and May Waterworks Festival. long distance phone call to Refusenik Lev Gandin in Moscow. to carry on the family name. Holocaust will heal through time. guest speakers. That is changing. sion has raised $120,8tS to date, for the 86 Federation/UJA campaign. one evening in your name. do not constitute a race. and 100 Harpoon air-to-sea missiles. through the House Foreign Affairs Committee. Campaign Cabinet on the Road"
we have met our objectives." April 13 Cong. Beth Hillel Breakfast. May 8 Business Executive Network. and Installation. 7 p.m. JCC. the massive "Super Sunday II"
DOMT PIT THIS <: ALL 0!\ HOLD. the October 1984 Community Mission. 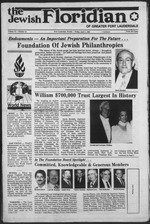 on behalf of the 1986 Jewish Federation/United Jewish Appeal. Ft. Lauderdale, will be in April. wish to emmigrate to Israel. tion $5. Home of Mr. and Mrs. Noon. "The Sky's the Limit,"
Lodge: 1 p.m. Meeting. Laud. schoolers and 7th grade. 8 p.m.
the writing of the Book of Exodus. a.m. Luncheon and card party. Rec. Center, 1050 Del Lago Cir. Yiddish Culture Club: 10 a.m.
Temple Beth Am: 7:30-9:30 p.m. Rabbi Paul Plotkin. At Temple. Safety Bldg., 4300 NW 36 St.
Hotel, 4040 Gait Ocean Dr.
breaklasl picnic lunch and dinner. Publix Baker.*! open at 8:00 A.M.
April 3 thru 9. 1986. Yes, a Matzoh factory. Really! Look for JCC's new "Hakol"
Broward in the years to come. ship Fund at the same time! Chase Federal for its outstanding corporate gift. Simon Dubnow have in common? upon the "Chair of Elijah." Meilature Go* Batkatbal NJ Clubs Cocktail Lounges 4 Band. place April 9-13 in Toronto. April 10 from 9:30 to 11 p.m. PLANNED ACTIVITIES / Breaklast, Lunch and Dinner. TAMARAC JEWISH CENTER (721-7660), 9101 NW 67th SL, Tamarac. 33821.
day 8:46 a-m. Rabbi Kart F. Stoat. Caator P. Hillel Braauasr. daily 8 a.m Sabbath 8 p.m., Sabbath morning 8:46 a.m. Rabbi Avraham Kapnek. TEMPLE BETH ISRAEL (742-4040), 7100 W. Oakland Park Blvd., Sunrise. 38813. Blvd.. DeerfMd Beach, 38441. Services: Sunday through Friday 8:30 a.m., 6 p.m.
Jissaa Lsagaer, Caator Shabtal Aekersasa. TEMPLE B'NAI MOSHE (942-6380), 1484 SE 3rd St, Pompano Beach, 33060. Service. : Friday 8 p.m. Caater Jebadah rWilbr.ua. TEMPLE SHA'ARAY TZEDEK 741-0296), 4099 Pine Island Rd., Sunrise, 33321.
day 8:46 a.m., 6 p.m. Caater Jack Marehaat. 8:46 a.m. Rabbi Israel Hals era. p.m., Saturday 8:46 a.m. Charles B. Frier, Presidest. 8 a.m., 6 p.m., Saturday 8:46 a.m., 6 p.m. Caater Paal Staart. Taeeieys 8 p.-. Rabbi Area Uebonaaa. Deerfield Beach, 33441. Service. : Sunday through Friday 8 a.m. and sundown. Saturday 8:46 a.m. and sundown. bi ChabB Seaaekier. Ceagregatiea anailiat: Hsrssaa Fleischer. Me> .rah Chspels, 2306 W. Hillsboro Blvd., Deerfield Bea 33441, Friday 8 p.m.
Raboi Nataaa H. Fish. Caater Harris Liriasia. TEMPLE EMANU-EL(781-2810), 8246 W. Oakland Park 1'lvd., Lauderdale Lakes. Bat Mitxvah. Rabbi Jeffrey BaDoa. Caater Rita Share. day 8:16 p.m., Saturday 10:30 am. Rabbi ShsMsa J. Harr. Caator Gees Cerbara. Creak Parkway. Rabbi Brace S. WarahaL Caater Barbara Roberta. evenings st 8 p.m. i"
life does a number on most of us. cleaning, to dinner with friends. or you're unable to wind down. just three of several possibilities. ding to ability to pay. the option to remain longer. choose their date of departure from the list of dates available. Tuesday, Thursday and Friday between the hours of 1 and 4 p.m.
ly of agencies. Ben Dinkes is the regional coordinator. tor of Federation's Chaplaincy Commission; Mrs.
Alfreide Colin, wife of the late Dr. Colin; Mrs.
presented its annual Dr. Alvin L.
Pa., and Dobbs Ferry, N.Y. Starting April 27th Rut Am Will Belaking Off Every Day For Tel Aviv. Pan Am.\bu Can't BeatThe Experience.